0 Comments Published by KL Ocs Kid on Tuesday, May 22, 2007 at 9:29 AM. 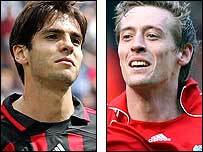 AC Milan forward Kaka says his team must pay close attention to Liverpool striker Peter Crouch during the Champions League final on Wednesday. Kaka and his side are favourites to win in the Olympic Stadium in Athens, but the 25-year-old Brazilian knows all about Crouch's aerial prowess. "He's a dangerous player in the air, when the ball is in the area he's always an opportunist," said Kaka. "We will have to pay attention to him if he plays." Kaka also said Milan are not worried about gaining revenge for their 2005 final defeat to Liverpool, they just want to win the European Cup for the seventh time. "For me the motivation is to get to a final and have the possibility of winning the Champions League," he added. "Everyone's talking about revenge for what happened in 2005 but I think what happened is a thing of the past. "It happened. We lost that final, Liverpool were the champions and it'll always be remembered that way." Kaka, who has scored 10 goals in the Champions League this season, paid tribute to Liverpool for reaching the final and lavished praise on Reds captain Steven Gerrard. "I think Liverpool, differently from Manchester United, play a game that's very characteristic of English football," said Kaka. "They're a very well-trained team by Benitez and a very tactical team, they mark tight and have all the traits of an English team. "Steven Gerrard is an excellent, modern player because he's a player who runs, marks, knows how to pass, cross, score goals, and is a leader in the field for Liverpool. "He's a player that I'd like to have in my team."